Ran my personal best of 13.147 from my 13.23 from last yr at the same track Cecil County on street tires. 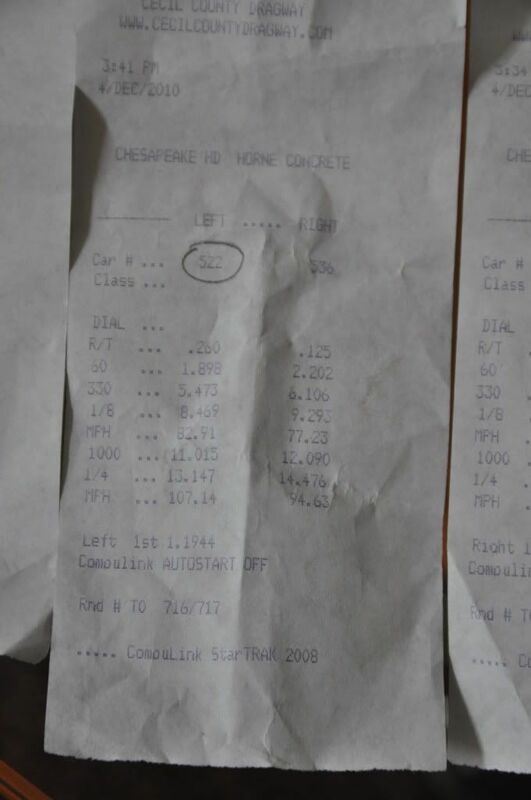 The car ran 13.1's 4 times in a row. I was shooting for 12's next time I will remove the passenger seat. I only removed my spare, subwoofer and floor jack. Wow that is an amazing time! Congrats! Thanks I was surprised myself. I was running faster on street tires than slicks. I did a total of 16 runs the best on slicks 4 runs was 13.4 so I put back on my street tires and ran 13.1 4 times in a row. Movin on up! Did you get any videos? Congrats on the time! Who was the 14.47 you ran? Also, what time is the T&T next Saturday (start/end)? that was against a maxima it was friend's brother. I have a video of my runs on slicks hopefully he has my 13.147 run because that was his best time also. My friend in his auto z ran [email protected] with a 75shot. I think I have the fastest NA VQ over here on street tires. TNT gates open at 8am racing 9am-4pm there was no more than 30 cars there yesterday. The staging lanes were empty at times. I want those numbers! Great times! So you ditched the Motordyne VQ for the Invidia? Also, why are you running such a tall tire? 265/40? Were you looking for slightly longer gearing? The VQ got even more quiet with ART pipes. I used to run 255/40 on my stock 18's, but got the the PS2's cheap. I have a 3.5FD on my 5at I guess that combo with my tires works. I couldn't run faster than 13.4 on 16in slicks for some reason. Conditions are everything and Cecil is a quick track, but this is proof to exactly how you setup an NA 5AT G/Z to run as strong as possible. IMO, the gear, the torque converter, and the shift kit are making a huge difference here. A 1.8 60' on street tires with a NA V6 Damn impressive. I did a quick check of the conditions at Rising Sun for 3pm 12/4. The calculated DA was -1,300'. Using this website http://wahiduddin.net/calc/calc_hp_dp.htm , the car was making ~107% of it's normal power compared to running at sea level. That means conditions alone were responsible for legit 20whp!!!!!! How's that for a free mod? I will be in Socal for the weekend so I won't be able to make it. AJ will probably be there with a couple of other people since it will probably be the same conditions. I will just get ready for next season which will be. Last edited by Dsskyline; 12-06-2010 at 08:01 AM. Here's a couple of your runs and thanks again for letting me hold your slicks. Im pretty sure my DR's wouldnt have hooked like that. My best on street tires FI at fontana was [email protected] against Rookie in his TTFX35. No telling what I would run here if still turbo. I have nitrous now, but I haven't used it yet.